Extremely helpful recommendations from the staff. Beautiful view and large terrace with comfortable furnishings. Walkable to all of Sitia. Flat easy parking and driving if taking the airport road to get in and out—possible to avoid the narrow and confusing streets downtown. Comfortable bed. Welcome bottle of wine. Provided beach towels. We upgraded to a sea view room and this was just perfect. We‘d definitely recommend to chose a sea view room. They are beautiful and spacious with good equipment and great beds. The owners are very friendly and even gave us a welcome basket. This was an excellent hotel, exactly like the pictures. I highly recommend it. Lovely family run hotel with attention to detail. You will definitely not be disappointed! We had a 6 night stay and wish it was longer, best experience in a hotel up until now. The view from the suite is absolutely breath taking! We found the room perfectly cleaned, with all the essentials you need for a comfortable stay. We also enjoyed the help of the receptionist, she was always there with suggestions of restaurants. Walking to the city takes less than 10 min. We highly recommend it! Everything was perfect. Apartment was great and nothing was lacking. You feel welcomed from the moment you step in. Thanks again for everything. We are not generally fans of Greek cities, but Sitia is an exception: lively, interesting and very friendly. The Porto Kaza apartments are excellent: well-fitted and with a panoramic view over the dock, the town and around the bay. The pool is nice to cool down. The hostess was efficient & extraordinarily helpful. There is also a lift to aid access to the lower apartments. 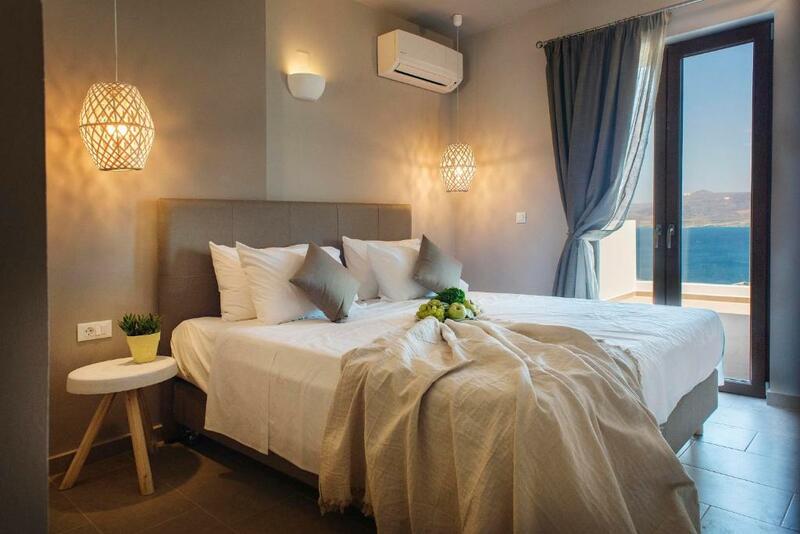 As a plus, the Porto Kaza apartments can be reached easily from the airport road, avoiding having the drive through the narrow streets of the town. There was no problem parking. It takes about 20 minutes to walk down to the restaurants (etc) at the harbour, but you can get a taxi back for 4 euros. There is a local swimming spot west of the harbour, but we preferred to drive to the larger beaches to the east. 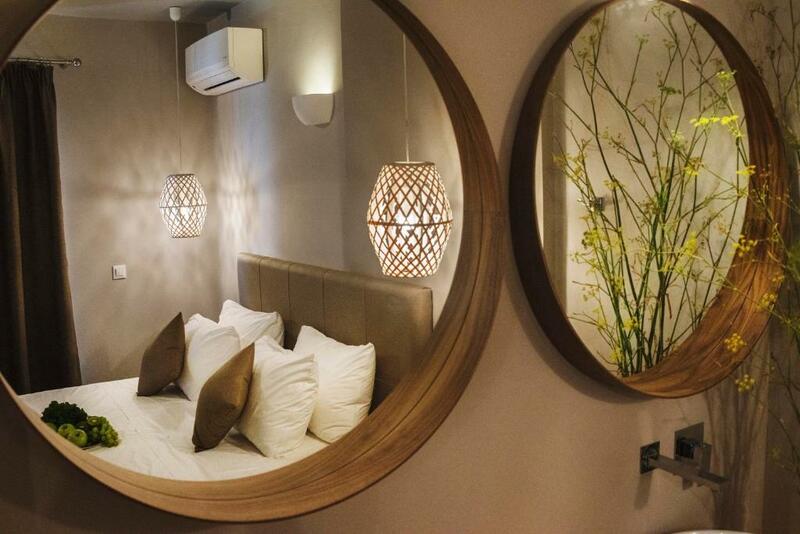 Fantastic flat, lovely beds and extraordinary hosting! We were made to feel so welcome, so many personal touches, great advice on trips and a very friendly Porto Kaza family! The flat was very comfortable. The room was very big, but cosy. The warm welcome of our host. 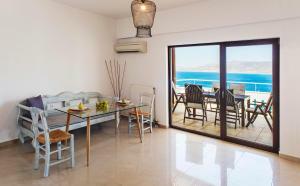 Great view over Sitia bay, very clean studio with comfortable beds. Sitia is a small town ideally situated to explore the east and south east. It is much less touristic than other Cretan cities, has very friendly people and some great restaurants. Do not miss the archeological museum! Very comfortable apartment, well located, wonderful view from the balcony on the sea, near the center of Sitia, very hospitable and friendly hostess And her daughter. Thank you. Lock in a great price for Porto Kaza – rated 9.5 by recent guests! One of our top picks in Sitia.Located in Sitia, the family-run Porto Kaza offers elegantly decorated, self-catering units with free WiFi and views over the Cretan Sea. The property also includes a common, outdoor pool. 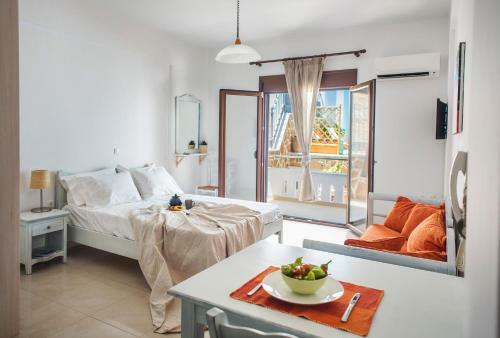 Fitted with Coco-Mat mattresses, well-chosen furnishings and earthy colors, all units at Porto Kaza include a well-equipped kitchenette or kitchen with toaster, stovetop, a coffee machine and a kettle. Air conditioning and a 32'' LED TV are also featured. The private bathrooms come with free toiletries and a hair dryer. Ierápetra is 25 mi from Porto Kaza, while Ferma is 19 mi away. The nearest airport is Sitia Public Airport, 0.6 mi from the property. This property is also rated for the best value in Sitia! Guests are getting more for their money when compared to other properties in this city. When would you like to stay at Porto Kaza? This apartment features a toaster, balcony and stovetop. Its bathroom is stocked with a shower. This apartment features a sea view, toaster and kitchenware. Its 2 bathrooms are stocked with a shower. This apartment features a electric kettle, balcony and sofa. This apartment features a toaster, balcony and microwave. 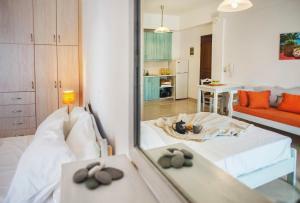 This double room has a kitchenware, seating area and air conditioning. 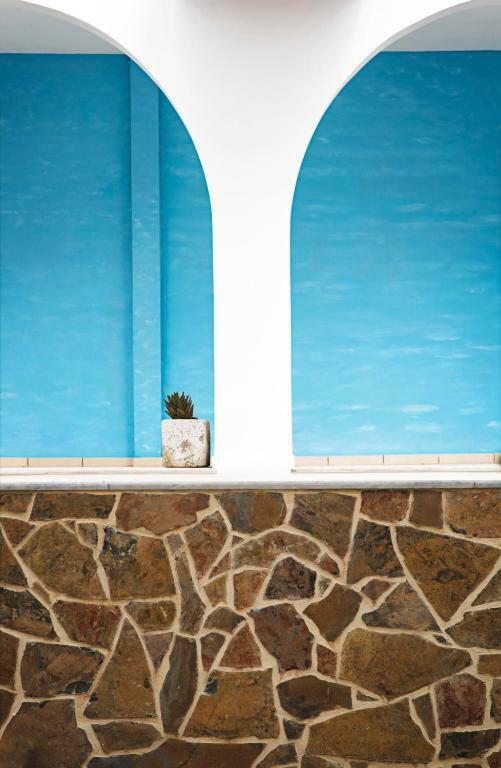 Enjoy Cretan hospitality in the family run Porto Kaza and experience unique moments of pure, unadulterated pleasure. Conveniently located to gently guide you through the majestic 'Oldtown' towards the Port and out into the Mediterranean sea. Just a stones throw either way and you'll find the towns fortress, ‘Kazarma’ or the hustling cafes and relaxing beaches of central Sitia. House Rules Porto Kaza takes special requests – add in the next step! Porto Kaza accepts these cards and reserves the right to temporarily hold an amount prior to arrival. Please inform Porto Kaza of your expected arrival time in advance. You can use the Special Requests box when booking, or contact the property directly using the contact details in your confirmation. There is a school yard to the back of the building with the occasional sound of kids playing. 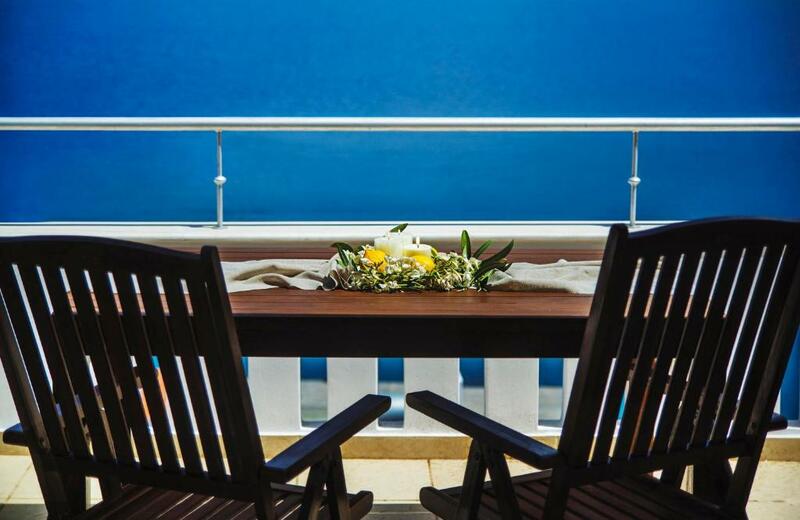 If you want complete silence the sea view rooms are definitely the perfect option. The vacation in Porto Kaza was wonderful! The appartment hotel is on the hill with great view on the Sitia Bay and port. It is situated 10-15 min walk down the hill from the center which is quite close to bars and restaurants, and far enough to guarantee you necessary privacy and quiet rest. We lived in the biggest appartment with 3 bedrooms, 2 bathrooms, a living room and fully equipped kitchen. The accomodation is gorgeous: spaceous, nicely furnished and designed, very clean and comfortable! The best view from the terrace, Friendly hosts, room service everyday. Special thanks to Miss Izampela for her kindness and tasty welcome basket with wine! Sitia is a small cozy town with clean beaches, tasty fresh food and great atmosphere for vacation! Vai beach is 24 km from the town and can be reached by bus or rental car. We liked the nearest small beach to Porto Kaza: it is near port, 3 minutes down the hill. It is one of the best on the island (we tried 8)! We surely recommend Porto Kaza for comfortable family vacation! WiFi didn’t work while we were there—it’s 2018 and this really isn’t acceptable anymore. Unable to charge devices unless present in the room due to all outlets shutting off when removing room key. We should have also realized it was not possible to check out before 10 or that needed to be arranged in advance as they held my passport and no one seemed available when we wanted to check out necessitating another long uphill walk from the beach to go back and check out. It took a long time to get hot water in the shower. We liked everything! Highly recommended! 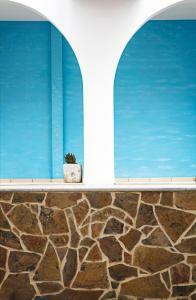 The friendly staff and extremely clean and well equipped room+outdoor pool. Very,very friendly staff.Apartment is amazing and next year again on the same place. Rooms are very clean,swimming pool also great.Beautiful view to the sea and port. We had great vacation there. Greetings and congratulations to the Porto Kaza family. Beautiful room, huge balcony, incredible views, and super friendly staff.